Métal Hurlant aka Heavy Metal, as it was known outside of France, started life as an influential science fiction/fantasy magazine and whilst there have been many attempt to translate the magazine success to film, the history of such attempts are littered with what might have beens. In 2011 another attempt was made to translate the magazine into a show, this time entitled Métal Hurlant Chronicles. Once again the name did not survive. The show gained only a moderate success and was cancelled after two seasons. 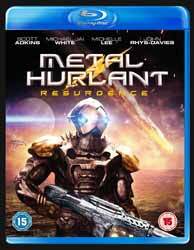 Season one found its way to DVD with the show's name intact, whereas season two was renamed Métal Hurlant: Resurgent. Released on Blu-ray, the second season consists of six half hour episodes. The basic premise is that the planet Hurlant has been destroyed by its own people and that the living head is condemned to wander the universe, touching lives and changing destinies by its passing. This allowed the makers to pretty much have a blank canvas to tell any story they wished. Apparently what they wished to do was squander the opportunity. Whiskey in the Jar; The Endomorphe; Loyal Khondor; Second Chance; Second Son; and Back to Reality. Audio options for both DTS-HD MA 5.1 or DTS-HD MA 2.0. The disc has no extras. With such high competition in the science fiction market, this really didn’t stand much of a chance. It is incredible to think this was made eight years after the start of Galactica (2003) and yet it looks like it was made twenty years before it.